Aches and pains melt away with a therapeutic hot/cold shoulder wrap from As We Change that’s designed to fit the contours of your neck, shoulders and back. Microwave for heat therapy; freeze for cooling relief. Reusable; one size fits all. Buckwheat filling. My husband uses it when his shoulder huts. When I need it I'm going to steal it from him. I set At the sewing machine for hours at a time, this is wonderful. Heats up in just a min. and stays warm for a long time. Helps the shoulders, neck and upper back have bought many for daugthers and friends. I spray a little forbreeze after I heat it up. Like adding my own fresh smell of my choice. Love the large wrap. I use it every day. Not only does it help my tight muscles it is long enough it helps with my congestion in my chest I have due to my COPD. I would definately buy it again. In fact I may order another in case I wear this one out. My wife uses it to continue her Physical Therapy treatments, Post cervical spine surgery. One (1) hour is what she uses it for, after she comes home from P/T, and it really helps to continue the treatment she gets. If it has a setback, the wrap is a bit bulky, and hard to fold, or compact; otherwise a useful product. My husband suffers from neuropathy in his neck/shoulder area and this is the first (and only) remedy I have found that actually relieves his discomfort. My daughter, a new mother, also uses it to relieve tension in her neck and shoulders from carrying the baby and all the bags that go with it. I use this for pain in my shoulder, and it warms and relaxes my shoulder and the added benifit is it warms and soothes your neck too. It was easy to warm in the microwave, but you need to fold it up into a square so that it fits. It warms equally all over and doesn't get hot spots. FINALLY, a product that doesn't come in a "collar" form and that covers the entire affected area. Easy to use, not even as heavy as a sweater over your shoulders. Really eases the pain by targeting more than one pain area at a time. Very relaxing! Easy to use and so helpful for pain. My husband received this wrap for Christmas, but the whole family uses it now and loves it. We now are buying them as gifts for other family members. Much more comfortable than the ones just for the neck and holds the heat for quite a while. I used it on my shoulders to relieve pain. It puts out good heat. Just have to have the right size wattage for your microwave. I love the relaxed warmth it brings to my spinal column before I retire. I believe I fall asleep faster and awake feeling far more rested. My husband strained the muscles in his back so bad that he could not walk upright. Once he started using this wrap he was able to stand up again. He keeps it in the freezer for a coldpack and uses it about 4 times per day. I am a cashier and at the end of the day my neck and shoulders are very sore this as been very helpful to help relieve the pain and help me relax. I heat it 3 minutes in my microwave on a towel and then wrap it around my neck and shoulders and work (transcribe all day) and it eases up my neck and shoulder pains and down my back for about 20 minutes and then I reheat for 2 minutes. I have nothing bad to say about this product. I am very glad I ordered it. Instructions say 2 minutes top in the microwave but a little more time 3 minutes top works for me. I use it for chronic pain in my neck,upper back&shoulders which my Drs suggest both heat an or cold treatments.So by having this heat/cold wrap I can get that in this one product! Another BIG plus is that I can move around with this wrap on my neck&shoulder whereas before I'd have to rely on a electric heating pad for heat which meant I had to stay in one spot or I'd have to use a ice pack which can be messy plus keeps needing refilled. With this product I either pop it in the mirocwave or the freezer depending on what treatment I wanted to use for my discomfort at that time! RELAXES MUSCLES IN NECK AND SHOULDERS. I HAVE AN OLDER MICROWAVE AND IT TAKES A LONG TIME TO HEAT UP. I love it, except for the fact that it doesn't stay warm long enough and I have to recharge it at least once during use. However, it is comfortable, and I not only use it on my neck and shoulders, I sometimes drape it over my knees. Once I heated it up and stuck it in my bed to warm it up one really cold night. Nice on a chilly evening! Just the thing for after work relaxing. After a half hour, I can face the rest of my day. Better than a popwer nap! My son used it for pain relief from a shoulder injury from sports. By alternating hot and cold, he got better much faster than before! I was diagnosed with Adhesive Capsilitus in my shoulder which caused me great pain. While undergoing physical therapy, they used warm moist heat treatment and it helped so I ordered one of these to use at home. What a remarkable difference! Not only did it relieve my shoulder pain when needed, but it helped for general stiffness. I highly recommend this product to anyone looking for a heat/cool pad. Easy to use, just heat in the microwave a minute then put on your shoulders for warmth on your aching muscles. I love that it covers the shoulders and upper back. I now do a lot of computer work, and my shoulders and upper back/neck get very tight. This is just the right size to provide comfort after a long day. I find it stays warm or cool for just the right amount of time. cheap outside material, can't heat long enough for it to maintain heat very long. It works okay, but needs more filling and could use some nice scent added, a littl stinky . . . takes longer to heat up than they say. I wouldn't recommend it to a friend. There isn't enough filling. I've only used it cold, so far. I was rather disappointed because it seems to be made cheaply. I don't like that the heat particles move unevenly. I get a lot of muscle tension and pain in my neck, upper back and shoulder areas. My triggers are snow shoveling, raking, trimming hedges or long hours on the computer. I read the comments from others. I can't expect it to retain heat like an electric device, but it really does cool off fast. For example, faster than a rice bag. It also doesn't get very hot...I've pushed the 2 min maximum just a smidge. I've not tried it cold...I get more relief from hot. I've not tried spot cleaning it, it's still new. It is comfortable, sits on the shoulders nicely, I can lay down with it. I wish there was a bit more buckwheat in each cell...it would be warmer that way. Yes it does get moist. So do rice bags and corn bags and bean bags. I don't love it, but I'm used to that feature of the natural seed heat pads. It tends to get less over time as the seeds dry out. And yes, other comments note that it does have a strange smell. To me, it sort of smells like cooked beets of all things. Another feature of a natural plant product. Some people found it offensive enough to discontinue use, but I'm Ok with it. Everybody had a different level of sensitivity to odors. It's a little bulky to try to fold back up and put back in its box. I still need to find a "home" for where to store it. Overall, I like it. It's not perfect and I would improve upon it, but the design covers my sore trouble areas well without me having to piece together two heat pads or decide which area needs it more. Helps my aches and pains. IF it had enough filling in it, it would be GREAT! But they cheaped out so it has to be heated quite often. Too bad!! the tiny buckwheat filling, is just that TINY. So small that it doesn't hold the heat. A waste of money. There needs to be a warning: since there are two products in the catologue that are moist heat related, they do not contain the same internal contents. The Sinus Wrap has microbeads that are not a grass product and won't cause allergic reaction. This product contains Buckwheat hulls, and while most are not allergic, some people can be if they have grass allergies. I heated it up without thinking, put it on: like others have said, it does not retain heat well, the distribution of the hulls are not even throughout resulting in uneven heat to the body. After reheating twice (both for 30 seconds each), and on my body for less than 30 minutes, I took it off and noticed a itch around my neck, then spread to my chest area, itching in the back as well: ended up with a rash. There are microbead backwraps that are available from the same folks that make the sinus wrap, that would be better suited for anyone with grass/ragweed allergies that can extend to Buckwheat/wheat. I sincerely hopes this helps someone who might have a severe reaction before they need to use their epi pen. i havent used the heat part of it yet because I like cold packs. It only keeps cold for about 10 minutes at the most. I was expecting at least half an hour. Takes a long time to heat in the microwave and then loses the heat within about a minute. What heat there is was uneven. The shape and style are great. But the material used to fill it is next to useless for holding heat. 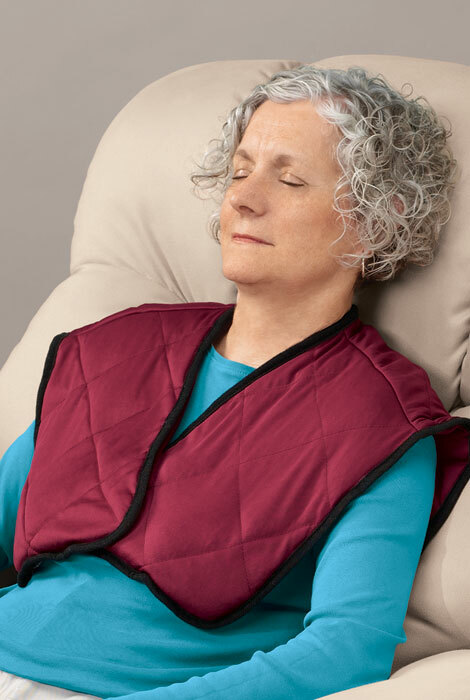 After heating it in the microwave, it holds the heat for about 4 minutes, maybe 5-6 minutes if I have a blanket draped over my shoulders covering the Therapeutic Wrap. Asking for a refund. It seemed like a terrific product for my sore, neck and shoulders caused by fibromyalgia. One wrap instead of two Ace ice packs! Not good for me. The cold lasted one minute, then cool within 5 minutes, then room temperature. Hot from microwave was warm for a minute or 2. Then room temperature. So very disappointing. I have not yet tried heating the wraps in the microwave, but I have tried placing them in the freezer. They do not get cold. Very disappointing. My friend suffers from severe shoulder pain. so this purchase is for my friend. Have been looking for a nice shoulder/neck wrap. I sit a desk and write and type all day. tired shoulders when I get home. quick way to relax in between massages. Having breathing problem, heat makes it better. it looks very comfortable and big enough to cover a big area. BEST ANSWER: Thank you for your question. Heat in 30 second increments for no more than 2 minutes. It is recommended for use with a microwave that has a rotating cooking area. We hope this information will be of help to you. BEST ANSWER: Thank you for your question. Because of the inside fill in the wrap, we suggest to only hand wash. We hope this information will be of help to you.